In what could be the cheapest vehicle on 4 wheels, India’s first and only quadricycle will go on sale beginning this October. While the RE 60, manufactured by Bajaj had received Govt approval in May, its inclusion into the Motor Vehicle Act as a new category of vehicle is pending. Now, Govt. sources have said that the draft notification will be issued soon since the law ministry has vetted the proposal of the Ministry of Road Transport to introduce the quadricycle as a new category of vehicle. Keeping safety and the earlier concerns in mind, the Govt. has also announced that materials like plastic, resin and cloth must not be used to manufacture quadricycles. Most car manufacturers including Tata Motors, Piaggio and Mahindra have been opposing the idea of introducing the quadricycle citing reasons of bias and the Govt. “pushing” the approval quicker than required. 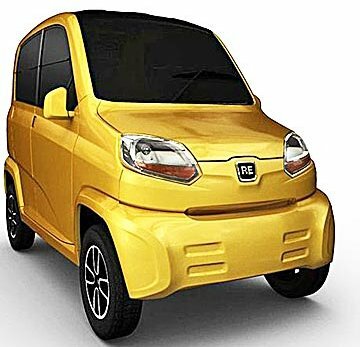 They feel that they need to be given time to develop such products of their own before Bajaj is given the approval to begin selling its quadricycle, the RE 60. Coming to the vehicle per se, there will be two categories of quadricycles based on their purpose. Passenger quadricycles will weigh a maximum of 450kg and will need to accommodate 4 passengers including the driver while goods quadricycles will be longer and weigh a maximum of 550kg with a load carrying capacity of 550kg and seating for two people including the driver. They will only be sold as commercial vehicles to begin with. All quadricycles need to be restricted to a top speed of 70kmph and must have a big “Q” written in the front. While the introduction of quadricycles in India can have its advantages and the roads can get rid of pesky and dangerous 3 wheeled passenger and cargo transport, it is important to keep in mind that they are adequately tested for passenger and pedestrian safety on the road.